Home / Le blog / Small dad Christmas with presents by thousands! Small dad Christmas with presents by thousands! And here is we are there, it is the last week before Christmas, the starting signal for a wild running to find the ideal present for your close friends! Follow me, I take you in the streets of Niort which are quite more led the some than the others in this period. I measured every place too to find the rare pearl. I take advantage of the good mood of the Christmas market, of wanderings which take place every day in the city to soak me with the festive spirit and good-humored which reigns around the preparation of this traditional party. I stop in front of the shop window of every chocolate factory where escapes a pleasant sweet flavor. I discuss with small craftsmen their know-how, their local production. I stop at the record dealer's, the bookseller … I command the beautiful yule log which will be on my festive table. But, I still miss some little gifts, you know the kind of small details which ends a beautiful decoration, a beautiful table. Small attentions which make quite the difference and which give the smile. 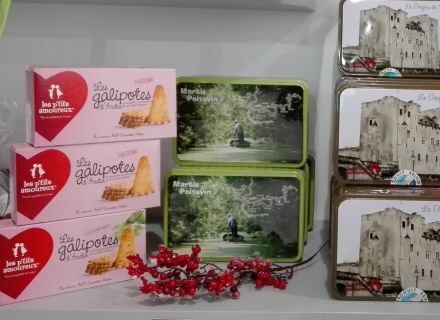 I end my long list with a small fast and effective passage by the shop of the Tourist office of Niort wishing to bring a regional imprint to my table. I suggest you discovering the selection of small objects which it is easy to slide in a plate, in the grandpa's old carpet slipper or even in a red boot of the father of Christmas over the fireplace. But, shut! To keep the magic of Christmas, It is important to stimulate the imagination of our youngs.
" In the factory to smile of Father-Christmas and Mother-Christmas, the sprites thus present you their following realizations ". 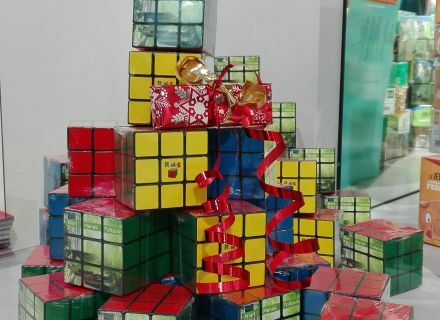 A cube which everybody knows because its invention goes back to the 70s: of cubic rubik. I chose it as the plate of my great-uncle who always listens to Bee-Gees completely in its car. It will also find its place in the apartment of my sister decorated in the style of the 70s. It will rest delicately next to her orange retro telephone. And then, my dad who will in vain try it to make it, to undo it, to redo it. I do not know for you but, for me, this little gift original and familiar to all its place in our big loving family of the vintage. He is present in our shop in 14.90 euros and in more he is personalized. 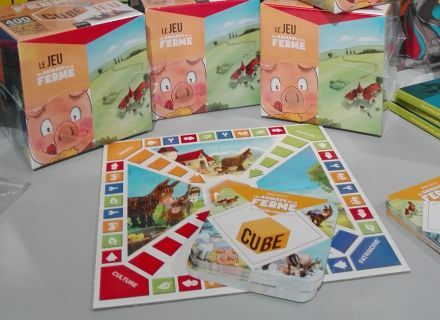 For the children, I opted for Luc Turlan's board game "The animals of the farm in Poitou-Charentes". What child is not fascinated by the animal kingdom? 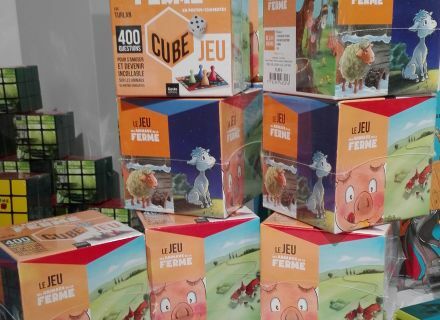 Offer him this game - cube which will allow him to become unbeatable on many subjects. Conveniently, you know how much do we matter of kilometers of leaks in the Swamp from Poitou? What quantity of water does a cow drink every day? To what were of use the pants of the seasoned donkeys? It is really a game surprising sharing in family! You will find him at the foot of the fir tree on sale in 13.90 euros. Having played cards and diverse board games, we end our afternoon of Christmas with a small coffee accompanied with a galipote, Small biscuit in the shape of ghost. You will find a whole assortment of boxes at all the prices according to the desires. From 2.10 euros the 120 gram box. It is now the hour for me to wish you all of merry Christmas and new Year holidays and very good Christmas by ending cheerfully your purchases! in Bessines Restaurant "L'Adress"	A gastronomic restaurant proposing an imaginative and refined cuisine uniquely based on fresh seasonal produce.